Images of desperation in aftermath of Hurricane Katrina-- Robert F. Kennedy, Jr., blames Katrina on George Bush not advocating Kyoto Treaty; Kyoto Kennedy Kites Katrina. Today, Robert F. Kennedy, Jr., a high-priest in the Church of GreenHouse Beliefs, revealed to a shocked and stunned world that he has scientific proof that George W. Bush and Haley Barbour caused Katrina and thereby caused the catastrophic damages and losses of lives in the Gulf Coast states such as Louisiana, Mississippi, Alabama an Florida. "Needless to say," wrote RFK, Jr., "Katrina would have been a mere pussycat at worst if George W. Bush were to have just advocated that the United States Senate ratify the Kyoto Treaty without any changes unacceptable to the United Nations' experts, otherwise known as the UN-IPPC (UN Intergovernmental Panel on Climate Change)." When asked about the report that meteorological scientists say the intensity or frequency of hurricanes cannot be attributed to "global warming," he said, "What do meteorological scientists know compared to the United Nations' Intergovernmental Experts?" When questioned about the inconsistencies and contradictions in the "man is causing global warming" theory, RFK, Jr., vehemently denied that the weight of scientific evidence attributes the greatest source of warming in the atmosphere to Scientific Flatulence. He also expressed warm support for the McCain/Liberman bill to codify the Kyoto Treaty as a part of United States environmental law. As a humanitarian gesture to the victims still trapped in flood-waters in the New Orleans area, RFK, Jr., immediately launched "Operation Kyoto Kites Katrina" providing boats to recover victims willing to repent for voting for Bush or to claim they voted for Kerry. To support this humanitarian project, John Kerry himself donated 18 tractor-trailer loads of Heinz Ketchup to provide nourishment to the victims who repent or claim they voted for him. These dramatic still-photograph images show the heroic nature of the humanitarian relief being offered by RFK to those desperate victims of flooding caused by Hurricane Katrina. To email links to this Daily Update installment (above) to a friend, copy and paste the Links Box below into your email. To email the links to a different installment, go here to find the Links Box for that installment. To access permanent links to installments pre-dating those included in the Links Box page, use PoliSat.Com's chronologically-indexed Archives. To access permanent links for animations, cartoons, song-parodies, find them by name in the text-index, find them by thumbnail-image depictions in the image-index or find them by date in the chronologically-index Archives. 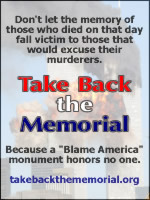 By the way, use the logo and link for "Take Back the Memorial" (right) for information about how you can support the effort to "Take Back" the 9-11 Memorial from the politically-correct crowd now planning to overshadow the Memorial with a "museum" chronicling the sins of America as though they were relevant to the current war against the medieval, totalitarian, perverted version of Islam being peddled by al Qaeda et al. Title: Kyoto Kennedy Kites Katrina. Permanent link to this Daily Update: http://polisat.com/du2005/du0508-21--31.htm#20050831-01. Permanent link to 320x240 static-image 'toon for this installment: http://polisat.com/images/KyotoKennedyKitesKatrina-WMV-Toon-00L.gif. Permanent link to 216x300 static-image 'toon for this installment: http://polisat.com/images/KyotoKennedyKitesKatrina-Toon.gif. Permanent link to full-size static-image "toon" illustrating this installment: http://polisat.com/images/NoThanksToWAHABOAism-WMVx2-00b.gif. To learn how to support the "Thanks in Our Name for Deeds in Our Name" project, go to http://PoliSat.Com/Thanks.htm. Links to the latest Daily Updates, Animations, Song-Parodies, Limericks & more: go to http://PoliSat.Com. Send this Links Box to a friend: Copy it, paste it into your email form, and send it. To send links boxes for other installments, find them at http://PoliSat.Com/EmailAFriend.htm. To request Links Boxes for Daily Updates by email, click here. Include PoliSat.Com's automatically-updated animations/'toons on your website-- Go here: http://polisat.com/BanAnimLogo.htm. Other sites that feature PoliSat.Com's Political Satire/Commentary-- Click here to view our Affiliates page.